1. Where is Talbot County? Talbot County, Maryland, is located on the Eastern Shore of the Chesapeake Bay, due east of Washington, D.C. Though it’s located approximately 90 minutes from both Baltimore and Washington, travelers must cross the 4.3-mile-long Chesapeake Bay Bridge near Annapolis, the longest continuous over water structure in the world. For up-to-the-minute traffic reports, call 1-877-229-7726. 2. How did Talbot County get its name? Talbot County (pronounced “Tall-but”) is named for Lady Grace Talbot, sister of Cecilius Calvert, Second Lord Baltimore, who served as the first Lord Proprietor of the colony of Maryland. 3. Is Talbot County on the water? You bet! Talbot County sits on the Chesapeake Bay, the world’s largest freshwater estuary. The county claims more than 600 miles of shoreline, including creeks, inlets, rivers and a couple of different bays. One side of Maryland’s Eastern Shore faces the Chesapeake Bay and one side faces the Atlantic Ocean. Talbot County is on the Bay side, which means that we have very few beaches. There’s a small strip of sand on The Strand in Oxford and at the public park, and there’s a small riverfront beach at Bill Burton Fishing Pier State Park in Trappe. 5. How accessible is the water for water activities (boating, kayaking, swimming, and sailing)? Look at a map and you’ll see that you’re never far from water in Talbot County. Boating, sailing and kayaking are among the most popular outdoor activities in Talbot County, and we are prepared to help visitors access the water. In addition to Talbot County’s 27 public landings, most towns have public docks, kayak launches and marinas, some with transient slips available for daily use. The Chesapeake Bay Maritime Museum is an 18-acre waterfront museum, and Talbot County claims a large portion of the Bill Burton Fishing Pier State Park. The county is full of charter captains who host visitors for rides aboard their fishing boats, skipjacks and sailboats. Stop by the Visitor Center for a complete list of public landings and water access points. 6. Are there good places to eat in Talbot County? You won’t go away hungry. We promise you that! Talbot County has many world-class restaurants. Around each corner is another culinary option sure to satisfy your appetite and budget. 7. What foods are unique to Talbot County? Chesapeake Bay seafood is famous around the world, and Talbot County is still home to many watermen who fish for crabs, oysters, rockfish or striped bass, and many other types of fish. 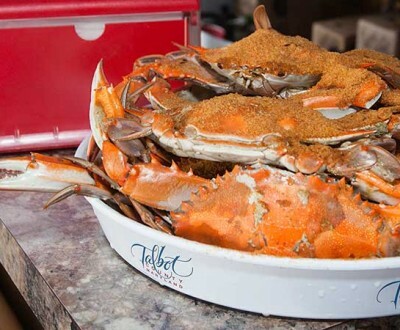 You can’t visit Talbot County in the summer without indulging in an old-fashioned crab feast with hot steamed crabs, fried chicken and corn on the cob. Most everyone here has a favorite crab cake recipe. Our cream of crab soup is legendary, and some say soft-shell crabs pan sautéed in butter are the best. In the winter months, oysters abound. Raw, fried or cooked in a creamy stew, they’re a staple on Talbot County menus. In the summer, produce stands pop up on almost every corner as farmers and gardeners sell the sweet corn, cantaloupes, tomatoes and other produce that grows in profusion on the Eastern Shore. 8. What local food favorites should we try while here? In crab season, look for cream of crab soup, Maryland crab soup, crab cakes, fried soft-shell crabs, and Crab Imperial. In oyster season, raw oysters (or oysters on the half shell) are a delicacy, but you can also indulge in oyster stew or Oysters Chesapeake. Rockfish, better known in other parts of the country as striped bass, is a staple year-round. 9. Is there anything for kids to do? There are many activities for children and families in Talbot County, including the Chesapeake Bay Maritime Museum, the Academy Art Museum, the Historical Society of Talbot County, parks, rails-to-trails, bowling, the YMCA of the Chesapeake, community pools in Easton and St. Michaels and the Talbot Community Center’s curling and ice skating rinks. 10. What is unique in nature here? Osprey, blue heron, migrating waterfowl (geese, snow geese, swan, ducks), diamond-back terrapins, Delmarva fox squirrels, wild turkey, deer and bald eagles are commonly seen in this rural, waterfront landscape. “The Hill” in the East End of Easton is believed to be the oldest free African-American neighborhood still in existence in the United States. Archeological research, through a partnership between Morgan State University, Historic Easton, Inc., the Frederick Douglass Honor Society and the University of Maryland at College Park, is underway, revealing the remarkable cultural and architectural significance of this community. A waterman is a person who makes his or her living on the water. This very general term is used because watermen often retrofit their boats to harvest different types of fish during different seasons. From late spring to early fall, they catch crabs. From fall through early spring, they dredge for oysters. In between, they fish on area waterways. Boating is a favorite activity in Talbot County for both residents and visitors, and you’ll see a wide array of water craft plying our waters. But the skipjack is the boat of the Chesapeake Bay and in 1985 was named the official boat of Maryland. The skipjack originated on Maryland’s Eastern Shore in the 1890s. These craft carry a single mast with two sails and range from 25 to 50 feet in length. The Bay was once full of skipjacks dredging for oysters, but today there are only a few remaining. The skipjack H.M. Krentz in St. Michaels and the skipjack Rebecca T. Ruark on Tilghman Island give tours for visitors.